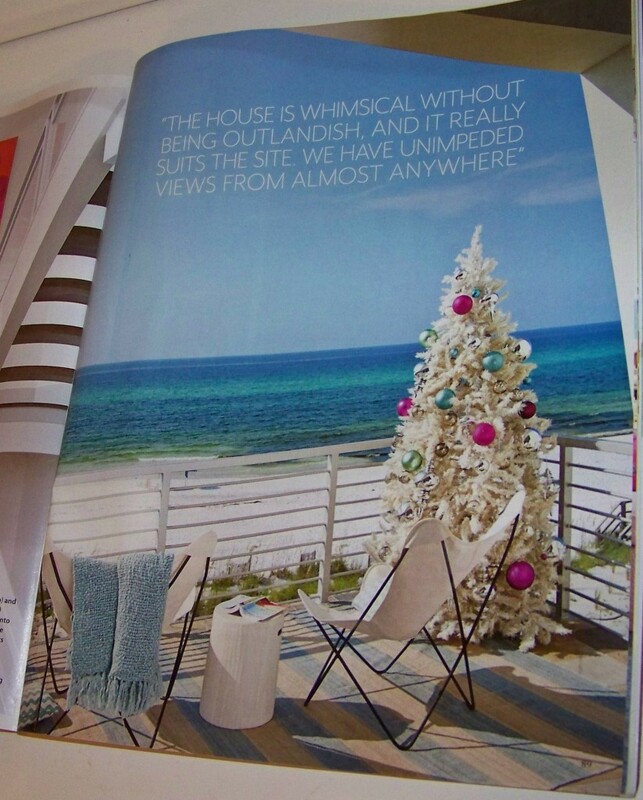 I love, love, love the magazine Coastal Living. I have since the first time I saw it, all those years ago sitting in the most unexpected and unworthy of places, in a Chicago podiatrist’s office, surrounded by old ladies complaining of bunions, jocks sporting fresh injuries and everyone in between. It was like a glimmering city on a hill, set apart from all the golf magazines and the tabloids around it. 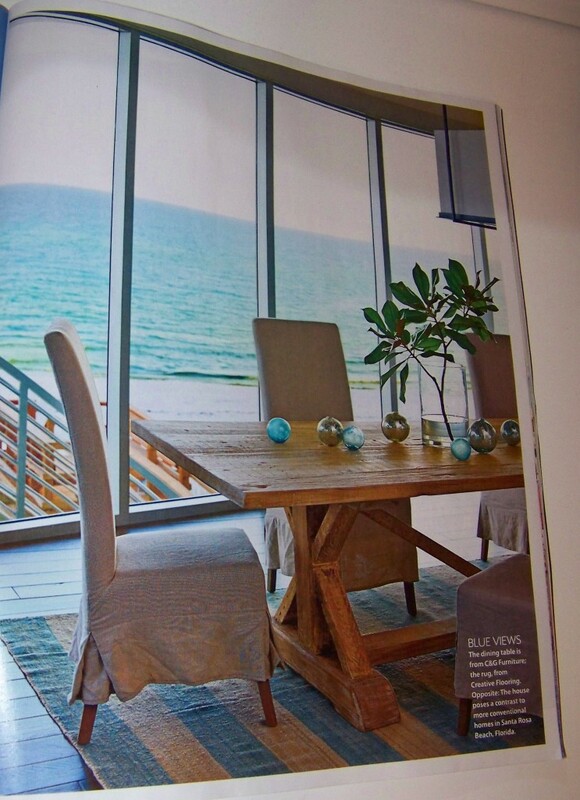 I opened its cover, and found myself wanting to transport to all of the coastal areas featured, to live in the homes with décor that spoke of the sea. To this day, it is the magazine most likely to sit on my coffee table, the one I most often retreat to when I find myself suddenly in the middle of a Friday night void of all obligations, social or otherwise. For me, there are few greater indulgences than an evening sitting on my deck with a wine glass in one hand and the latest issue of Coastal Living in the other. But, well, there’s a but. I am now in fact living on the coast, and while it is a place wonderful in ways I cannot always fully express, it’s not always quite like the world Coastal Living has so magnificently and artfully created. In my case, it’s more, well, real. My coastal world comes with three small people to maneuver around, an incessantly-talking husband to think around, an actual budget, an absence of professional decorating assistance, and a design-and-make-it-happen team of one. So, while I look both longingly and appreciatively over all the brilliant décor and ideas in Coastal Living, my reality is still my reality. Despite the vast inspiration that island living provides, I still come up drastically lacking in my ability to actually make things look, well, good. 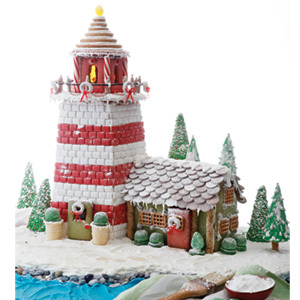 So while I want my gingerbread house to look like this lighthouse, more reflective of my environment, instead, it looks like this. And that’s only because it was actually made by my first-grader. 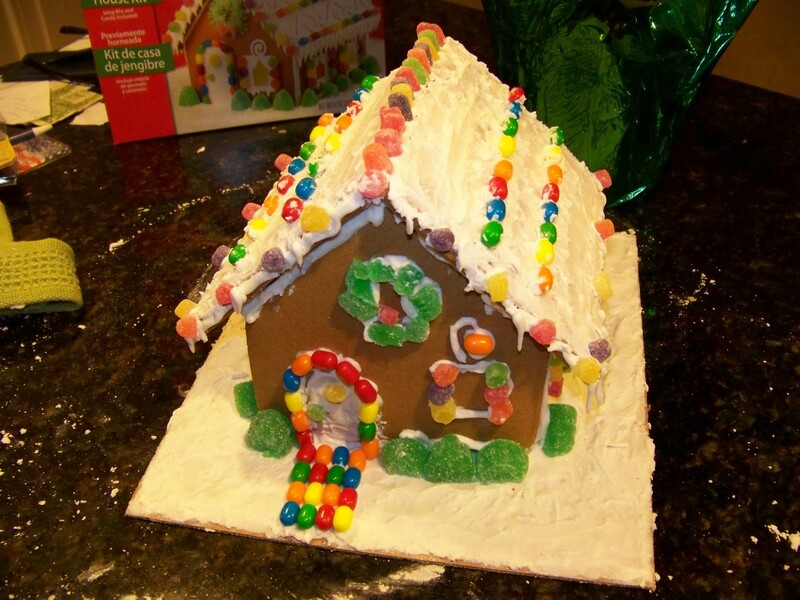 I shudder to think what gingerbread monstrosity would have been birthed through my efforts alone. I love this look, but for one second, I could not maintain a table like this in my house. Although maybe if I had a loud whistle and nothing else pressing in my day, I could do it for a short while. ‘Cause, you know, so many times I find myself with a whistle and absolutely no daily objectives. I’m sure they will say the beauty of this arrangement is that there is no correct way to arrange the bulbs, that they’re meant to sprawl across the table, life-like. Excuse my ignorance, but I beg to differ. In my world, lickety-split, the boys would find makeshift pool cues, and those ornaments would be everywhere but on the table. Everywhere as in the literal everywhere, y’all. I hardly think they mean that kind of life-like. I don’t have a swimming pool, but if I did, again, it would just defy the laws of the small male constitution for a tree placed in close proximity to a pool to not end up in the pool in short order. Someone would be bound to determine whether the tree could float. Later, he would protest, in all seriousness, that it was all done merely in the interest of promoting scientific experimentation. Here’s the thing. I really covet this look for my house. I always have. But, it’s not happening. Because, on my particular ocean, known by many as the Atlantic Ocean, there’s something called wind. 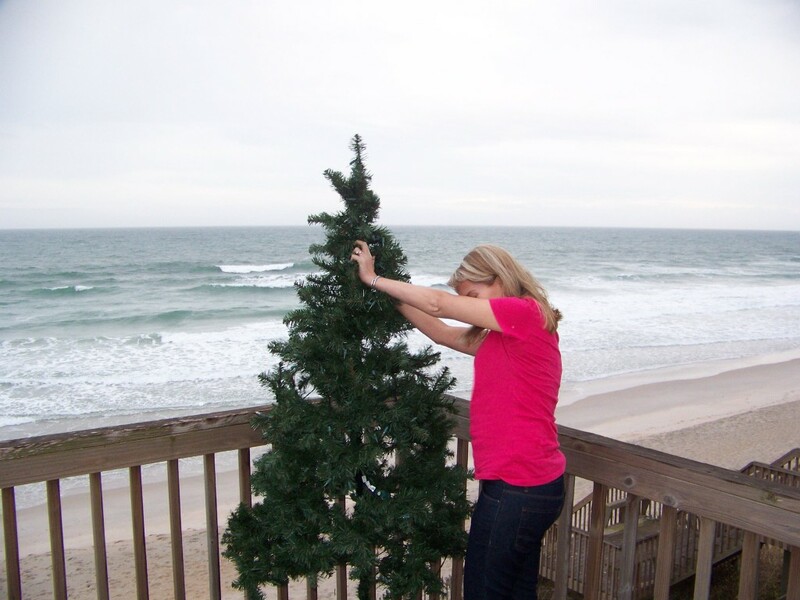 Just for kicks, however, I decided to take an old Christmas tree out on the deck this afternoon, to see how it would fare. When I stepped back to take a picture, it immediately did this. After three tries with similar results, I found myself holding on to the tree and attempting to yell above the sound of the waves, screaming for LCB using his Christian name to “hurry up and take a picture before your tree and your wife end up airborne already!” Baby-girl offered her support too, yelling “Emergency, emergency!” with all the strength her four-year-old lungs could muster. I suppose I could tie the tree to the railing somehow, but then imagine if I actually got audacious enough to try to decorate it. I think we’ll just let this particular dream go. I could go on, but it’d hardly be attractive, and I think you get the point. Coastal Living is the stuff of dreams, dreams packaged with the best of trimmings. The Christmas we will have here on our island will also be the stuff of dreams, just minus the Christine-made trimmings. And the tree? I don’t intend to spend my Christmas chasing my tree halfway across the island if it catches a wind gust, which it inevitably will. So, it’s staying inside, where all sane people keep their Christmas trees. love your post. love the picture. I agree the tree should stay inside. Have a Merry Christmas. Hope to see ya Christmas Eve!! I think those magazines just exist to make all of us normal people who actually eat on their tables and sleep in their bedrooms feel inadequate. 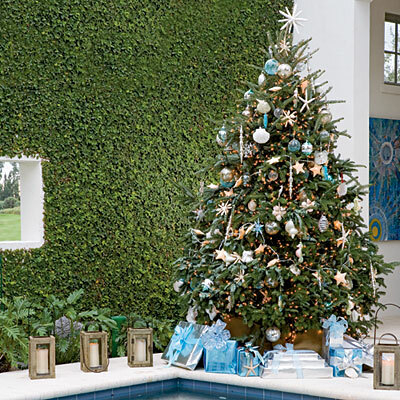 But we’ll all keep dreaming of having Christmas trees by our pools. 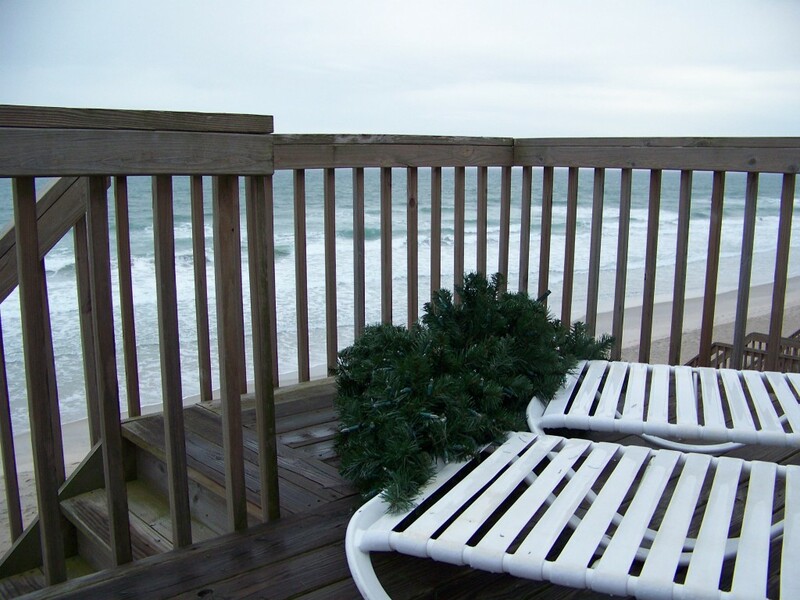 Have a Merry Coastal Christmas! And we’ll try to have a white one up here! Yeah, I’ve heard it’s been pretty mild up there thus far. Hope you get a light blanket of it in time for Christmas, however. Merry Christmas! You definitely get a Gold Star for effort! After seeing the magazine photos, I was just as smitten with the outdoor Christmas tree idea as you were, and I was plotting to try it Up North. So imagine how hard I laughed reading your comments about the wind, and seeing you holding the tree steady to snap a photo. We have a bit of wind here too, so I envisioned the exact same scene playing out on my deck–with a few well placed eye rolls from Bacon Slayer, of course. Maybe if you get a good snowfall that covers enough of the base of the tree, it would hold steady. Good luck with the ornaments, though. You probably have so many beautiful trees growing in or near your yard anyway, that you could just put lights on one or two of them and call it a day. When we lived in Chicago, we had 5 huge trees in our front yard. One year, LCB surprised me by putting lights all up the trunks of the trees because I had admired a similar look at a restaurant hidden in the woods that we liked. Oh, and LCB was doing plenty of eye rolling during my tree fiasco! Hahahaha. I die! I am so proud of you for attempting to action the tree outside, just because. If I had a dollar for every time I tried to action something from a design magazine in our home that failed epically, I would be a rich, rich woman. I’m glad I’m not the only one, because I watch the shows on HGTV and they make it look so simple and natural, grabbing a couple of things from nature and a couple of things from the garage and presto, there’s the next cover of Better Homes and Gardens. I could tinker around until I’m 80 with the same items they just found “lying around the house” and not come up with something anyone would ever want to look at, even if I paid them to do so. A+ for effort……..but that is so not realistic with beach “breeze”! I know. I laughed when the article said something about using sand bags. As if. And again, what am I going to do, superglue the ornaments on? I can’t imagine the pains they went to to get the magazine tree looking perfect and then quickly taking pictures before the breeze picked up again.